NEW YORK--(BUSINESS WIRE)--JetBlue (NASDAQ: JBLU) today announced it is raising the standard on premium travel and evolving its Mint premium experience as it expands to more markets. Starting in November 2016, JetBlue will introduce its new custom-designed amenity kits from New York City-based Hayward and Hopper, returning classic Hollywood sophistication to air travel. Travelers will feel refreshed on long flights with the help of men’s and women’s kits and their included assortment of personal care products. 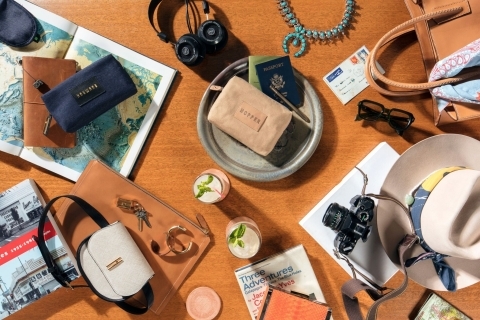 Hayward and Hopper creator and founder Marin Hopper, daughter of Hollywood legends Dennis Hopper and Brooke Hayward, drew upon her creativity, personal style and extensive family archives to create chic, comforting and classic amenity kits for JetBlue’s Mint. The Hayward kit, designed for female customers, is made from signature Hayward denim and includes a delicate brass zipper, designed by her legendary grandfather, Leland Hayward. The Hopper kit, designed for men, is fabricated in a natural cotton canvas with an artisanal feel. From all natural lip balms to refreshing towelettes, all personal care products included in the kits are made in the United States and hand-picked by Hayward and Hopper. Products are packaged in the exclusive Hayward bag for women and Hopper bag for men. Each kit also comes with a matching eye mask as well as screen cloths illustrated with photographs taken by Hollywood legend Dennis Hopper and provided by the Hopper Art Trust archives. With Mint, JetBlue introduced its alternative to outdated business class offerings, first from New York to Los Angeles and San Francisco – offered at an affordable price – making premium travel more accessible and opened a new market untapped by high-fare carriers. Re-imagining the domestic premium experience, JetBlue introduced private suites, the longest fully-flat bed in the U.S. domestic premium market (a), complimentary entertainment options and hospitality-trained crewmembers. Mint customers also enjoy a signature cocktail, a tapas-style menu curated by New York City restaurant Saxon + Parole as well as fresh espresso from the first purposely-built cappuccino machine for a U.S. airline. Overall, Mint has exceeded expectations and JetBlue is focused on expanding Mint to even more cities on the east and west coasts as well as in the Caribbean. JetBlue plans to bring Mint to 13 cities with up to 70+ daily flights by the end of 2018. Mint is currently offered on select flights to Aruba, Barbados, Boston, Los Angeles, New York and San Francisco. New service to Grenada, St. Lucia and St. Maarten begins in November and Las Vegas, San Diego and Seattle in 2017. JetBlue partnered with in-flight experience specialists Clip to create these new amenity kits. JetBlue is New York's Hometown Airline®, and a leading carrier in Boston, Fort Lauderdale-Hollywood, Los Angeles (Long Beach), Orlando, and San Juan. JetBlue carries more than 35 million customers a year to 97 cities in the U.S., Caribbean, and Latin America with an average of 925 daily flights. For more information please visit jetblue.com. (a) Based on avg. length of lie-flat beds on domestic premium flights operated by U.S. airlines. HAYWARD and HOPPER are American luxury fashion brands inspired by generations of Hollywood heritage. Created by Marin Hopper, the brands embody a style that is timeless and effortless, a chic combination of East Coast sophistication and West Coast ease. HAYWARD is the women’s accessories brand, named for Marin’s grandfather, the legendary Leland Hayward, one of the progenitors of Hollywood’s Golden Age. Hayward both embodied twentieth century American culture and created it, founding Southwest Airways, Universal Pictures, and producing countless Broadway and Hollywood hits. HAYWARD and HOPPPER are available at Hayward House, located at 131 East 70th Street in New York, and online at haywardluxury.com. Both brands are currently sold exclusively at Bergdorf Goodman in New York, throughout the US and Canada in other specialty boutiques, and online through e-commerce partners, including Moda Operandi. Starting in November 2016, JetBlue will introduce its new custom-designed amenity kits from New York City-based Hayward and Hopper, returning classic Hollywood sophistication to air travel.